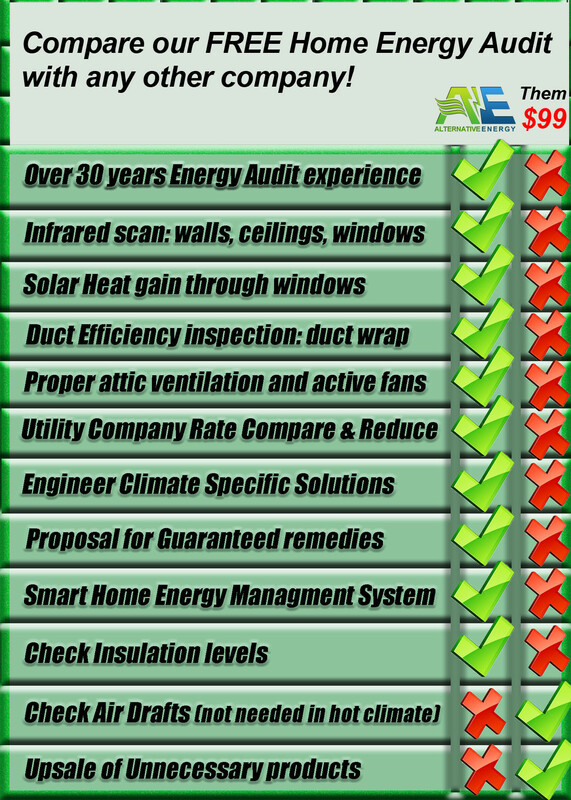 GET A FREE HOME ENERGY AUDIT IN GILBERT - SAVE 25-99% ON ELECTRICITY! If you are a homeowner that just searched the phrase “Home Energy Audit Gilbert”, chances are, you’re hunting for energy auditors near your home to inspect it for energy consumption/loss to see how much money you can save on electricity. If this is the case, Alternative Energy, LLC can help in multiple ways! For a limited time, Alternative Energy, LLC is providing FREE HOME ENERGY AUDITS TO GILBERT RESIDENTS! (Save $500) Our free home energy audits give homeowners the opportunity to find their energy consumption problems for free and find those problems and save up to 99% on electricity with a list of revolutionary energy products! Alternative Energy, LLC offers one-of-a-kind energy saving products that can help Gilbert homeowners save up anywhere from 25-99% on electricity (Design your custom package). Live in the Gilbert Area and want to get a free energy audit to find out how they can save money on electricity? Click here to save anywhere from 25-99% on residential electricity and schedule your free home energy audit in Gilbert. Gilbert residents can schedule their free energy audit by giving Alternative Energy, LLC a call today at (480) 744-1803. Helping Gilbert homeowners owners find energy savings solutions that work!